The poisoned needle that threatens a little child’s life is the only clue for Miss Lucretia Brent to solve the puzzle of a deadly disease that comes upon the Dukedom of Breckenridge. Sampson Claridge, the fraught Duke of Breckenridge has to manage not only his dukedom but also his little sister. Completely enamored by the new governess, he needs her help to find the way out of the impending tragedy that threatens his kin. Sins of the past awake and they are all used for blackmail. As time runs short, Lucretia and Sampson have only a few hours to solve the puzzle or forever be gone. 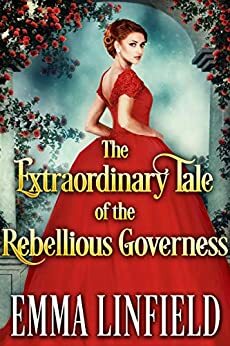 *If you like powerful Dukes, loving Duchesses and a marvelous depiction of the majestic Regency and Victorian era, then The Extraordinary Tale of the Rebellious Governess is the novel for you. Emma Linfield's 10th book is a historical Regency romance novel of 80,000 words (around 400 pages). No cheating, no cliffhangers, and a sweet happily ever after. Pick up "The Extraordinary Tale of the Rebellious Governess" today to discover Emma's new amazing story! This was a most delightful story. An orphan who was employed by a duke to be a governess for his sister ended up being much more. Efficient in all that she did she was much liked by all. The story has suspense as someone is trying to murder the Duke and his sister and then the governess because she thwarted his attempts on the child. The duke and the governess fell in love and eventually married. Before this there is a lot of action which keeps you guessing. Must read. 5.0 out of 5 starsDelightful Regency Tale! Delightful Regency tale full of twists, intrigue, suspense, danger, fear and romance. This well-written storyline kept me wanting to keep turning the pages, even when I needed to go to sleep. The characters are realistic with strong personalities and made you feel as though you were right there following their struggles. I enjoyed the ending very much and highly recommend this book. I received an ARC copy of this book and am voluntarily leaving an honest review. This book is a very enjoyable read from start to finish. The story is intriguing and entertaining and well written. The characters are endearing and well developed, and the plot keeps the reader's attention and interest. Five stars for this wonderful story. Love an epilogue, and an extended epilogue is always a bonus.